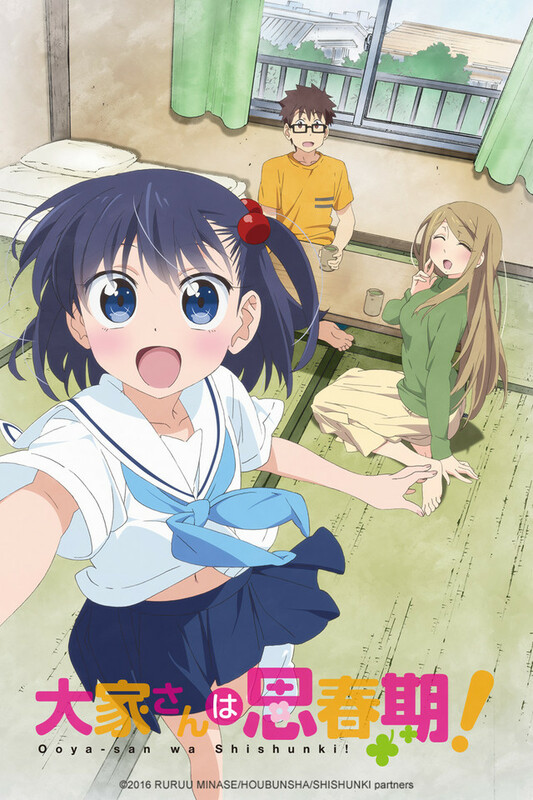 I normally don't get into shorts, but this season has some pretty good ones (Ojisan to Marshmallow, Please Tell Me! Galko-chan). This show is easy to get into and you'll end up wishing it was longer. If you are looking for an easy going show, this one is definitely for you! Initial Impressions! A solid start to this anime short. I will update this review as more episodes come out. Ooya-san wa Shishunki is the story of Chie Satonaka who is the landlord of an apartment and also happens to be a cute middle school student. A guy (not much information given on him in the first episode) moves into the complex to begin a new life. Not only is he happy to have a cute girl for a landlord, but is also happy to have a cute neighbor named Chie Satonaka. This is an anime short that runs for 2 minutes, with a 30 second opening it's really just 1 minute and 30 seconds of screen time. I can't really talk about what goes on in the episode because it's so short. I can say though that the first episode uses it's short screen time wisely. It manages to create characters with personalities, have funny moments, and sets up the rest of the series. I am certainly looking forward to watching this series as short as the episodes may be. The reason why I gave it four stars is because it was an entertaining start, but didn't blow me away in any way. What can I say? I am a defective human being. But this simple and lighthearted short series offered much needed refuge from the lethargy and agony of existence, even if only for a short moment. It is this momentary respite in which I felt, for the first time in what seemed like an eternity, that there is some right with this world, that maybe things will be alright, and that perhaps there is hope after all. In my opinon this is how lighthearted series should be, I really enjoyed this and the producers seem to be very aware of how this shouldn't be over the top. The directory reminds me of Squid Girl in the way it avoids these cliche comedy anime features, and the way the episodes are just shorts reminds me of "I can't understand what my husband is saying"
There are only 3 episodes out at the moment, I'll edit this if I'll have anything to add. I realized all my reviews titles started depicting the type of series I normally watch. The anime was sweet, funny and overall done very well. It was one of those that was kinda fresh for me because I have never seen a series based around an apartment owner, let alone one that's a middle schooler lol. The anime had it's down moments, but if you can get past the 2 bad episodes it has, the rest of the series makes up for it. A real quick cute and refreshing show. It may feel extremely rushed due to its short duration but you will be delighted. It is a very cute show, if it was a bit longer like at least 8 mins or 24 mins it would've been so much better. I am hoping for a 2nd season since the ending didn't really cover that much. Cute and short but nothing amazing. This show was short and sweet, but I guess I expected more from such an interesting premise. The characters were fun, don't get me wrong, but I saw a full 30min per episode style anime sprouting from this kind of title. It left me a little disappointed in the long run, but still turned out cute enough. You should watch this if super short anime are perfect for your schedule. Super cute and fun short. I love short anime. They are great for gap fillers, and just to blitz through. Sometimes you find ones that are really cute and fun, but they're so short they're over before you even realize. This was definitely one of those for me. I really wish there was more! It's adorable and cute and if you enjoyed Komori-san Can't Decline you'll be happy to know it takes place in the same universe (watch for the cameo!) : a 3 minute universe where cute characters do cute things and everyone is happy and smiling. It's a nice little pick-me-up, worth a try. Yeah, if they like 3 minute shows. There's no fanservice and no specialized knowledge needed. The one tenant does seem a little too into the middle school girl landlord so there's that. Before you ask: No, not that Satonaka Chie. That one is from Persona 4. This one is small and cute, and she is also the landlord (despite being in middle school). The show only goes for two minutes at a time, and there is just enough space in there to squeeze in antics involving Chie, two of her tenants (Maeda and Reiko), and her friends at school. You can also catch cameos from Komori-san Can't Decline. 5 Stars.